1942 - A ski trooper bandages his eyes with gauze to protect against sun blindness in a snowy wilderness. A beautiful young woman in a hijab is blind or weakly imposing, a wheelchair reading a braille font. Braille Chess. Close Up. Pan Shot. Buenos Aires / Argentina - 20 June 2018: Braille Book with a Bear Illustration. 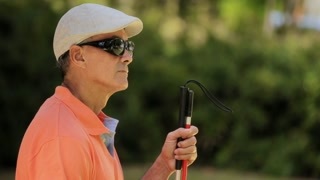 Filmed in a Blind School in Buenos Aires. Louis braille Statue in a Blind School of Argentina. Blind Children Playing On Chess for Blind or Visually Impaired. Blind Children Playing On Chess for Blind or Visually Impaired.  Zoom In. Tucuman / Argentina: 20 March 2019: Entrance of a Public School for Blind People in Tucuman Province, Argentina. Louis Braille School. Blind Children Playing On Chess for Blind or Visually Impaired. Close Up. Blind Child´s Hands Learning the Braille Alphabet in the Blind School. Blind Kid Writing Braille. Close Up. Full HD. 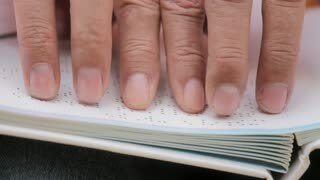 Blind Young Woman Reading Bronze Plate in Braille. Close-Up. Full HD. 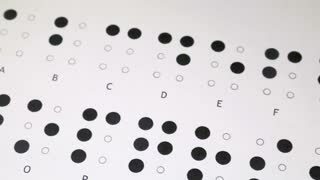 Person learning to read braille lettering.